8 (8, 9, 10) 1 3/4oz / 50g balls (each approx. 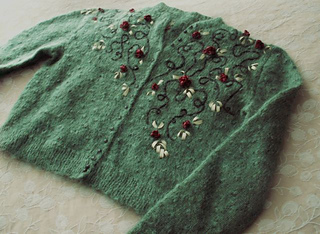 121yd/110m) of Baruffa/Lane Borgosesia Maratona (wool 4) in #8533 celery. 1 spool each (each approx 100yd/90m) of Judi and Co 1/2 in ribbon (rayon 5) in olive green and dusty pink, or seam binding. 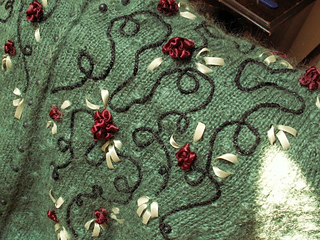 The original ribbon used for this sweater is no longer available. A comparable substitution has been made which is available at the time of printing.